In his briefing, de Marnhac also noted the average age of Kosovo's Albanians was 28, while the figure for Serbs was 54. "In the mid to long term there will be some kind of biological end to the problem here because, you know, one of the population(s) will simply disappear," he said. No people - no problem. Simple as that. It used to be called genocide, or "ethnic cleansing" (a term first used by a Kosovo Albanian official in a 1987 New York Times story). Now it's "biological end." Want to take over a bit of territory? Easy! Breed like mad - a dozen kids per family, or more - then when you become a majority, launch a rebellion. If you plead genocide, you may get lucky and the Empire will fight an illegal war of aggression on your behalf, and give you the territory on a silver platter. Bonus points if you've managed to soak the host country for welfare benefits for five decades so you can support your breeding program, making sure all those kids had schools, hospitals, government-subsidized jobs, etc. Anything else would be a violation of their human rights, you know... Once you have the territory, all you have to do is abuse the natives to the point of "biological solution," and there you go. Seriously, though, de Marnhac's remarks should not come as a surprise. This cold-hearted, bigoted thinking explains how KFOR has "protected" Serbs in the province since 1999 - basically by putting them in ghettos and waiting for them to die off. 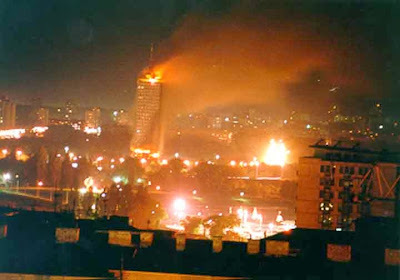 One must remember, KFOR's function was never to protect non-Albanians from the KLA, but to protect the KLA from the Serbian army and police. They looked the other way as KLA burned, looted, murdered, threatened, extorted, besieged, stole and otherwise abused Serbs, Roma, Turks, Gorani, and other communities in the occupied province, only stepping in when abuses became bad enough to warrant unwanted media attention. But he is right, you know. Serbs cannot hope to hold Kosovo if they are not willing to live there. They cannot hope to hold Serbia itself, if they don't start having babies. That's one way to make sure de Marnhac's prediction never comes to pass.